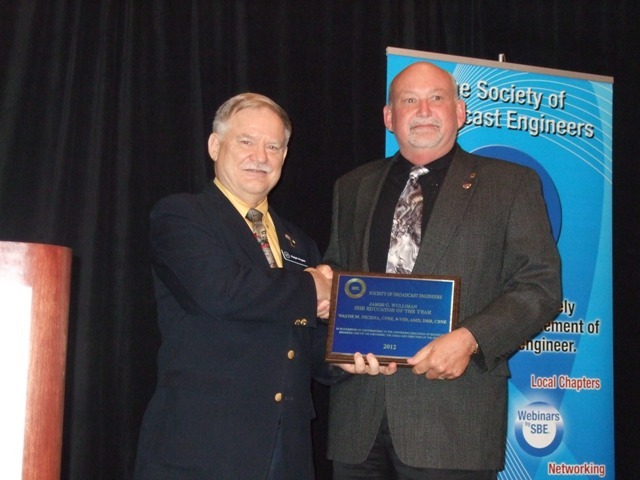 SBE President Ralph Hogan, CPBE, DRB, CBNE, congratulates Wayne Pecena, CPBE, 8-VSB, AMD, DRB, CBNE, on being honored as the 2012 James C. Wulliman SBE Educator of the Year at the SBE National Meeting in Denver in October. The next IP Networking Webinar by SBE explores routing and switching. Presenting this webinar is 2012 SBE Educator of the Year Wayne Pecena, CPBE, 8-VSB, AMD, DRB, CBNE, who frequently presents for the SBE. This webinar is the second in a series that focuses on various aspects of IP Networking. Subjects explored in this webinar include how Unicast and Multicast is implemented in IP Networking, when to route and when to switch, and implementing QoS for audio and video applications. This webinar, which takes place Tuesday, December 4, is one of many geared toward helping broadcast engineers prepare for the SBE Certified Broadcast Networking Engineer™ (CBNE) certification exam. Visit the SBE website for more information and to register.